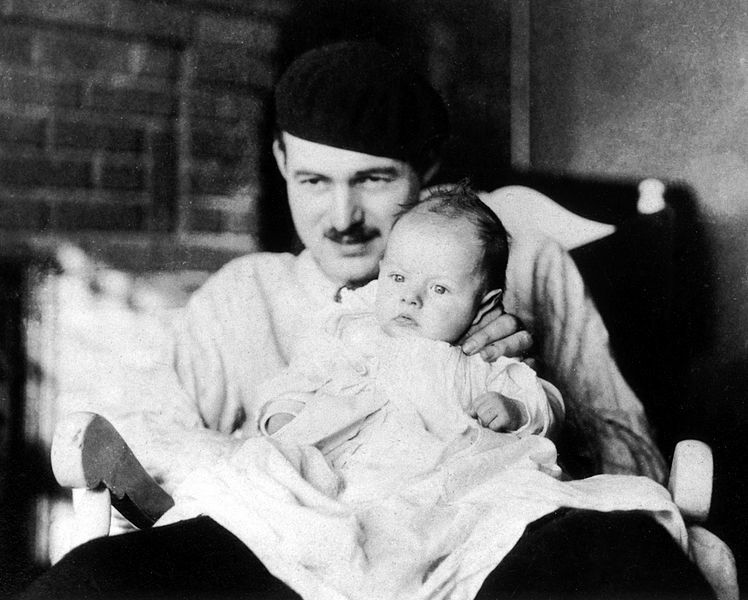 Ernest Hemingway with his son John Hadley Nicanor (Bumby), 1927. One semester I had a student who turned in a story that I believed was plagiarized from Hemingway. The student had frequently spoken of his admiration of the minimalist master, and the story he turned in had the tell-tale traits, at least superficially. I had seen (even assigned) emulations before, but usually they were ham-fisted, amateurish, and identifiable as copies. Usually my students couldn’t keep their own personalities from peeping through. I had also seen completely plagiarized stories—once a student had turned in an entire Stephen King story with even the title intact. So I began searching for this Hemingway story. I couldn’t find it. And I had to admit that if I couldn’t find it, the student probably hadn’t found it anywhere either. Creative writing students seldom plagiarize, and in my experience they never do so with enough leisure to hide their trails. The story, I decided, also didn’t quite have the Hemingway attitude toward women. I finally came to the conclusion that this student had just written a very good stylistic emulation of Hemingway. The following year I had him in another class, and by then he had begun to write like himself. This is the usual trajectory for writers. But it might be different for a talented painting student. At any rate, the production of fake manuscripts by dead famous authors is not a big business. It’s been known to happen, but the difficulties seem to surmount the temptation. Even though the Antiques Roadshow estimates that the lost suitcase of a pile of Hemingway’s manuscripts might reap $3 to 4 million if it was ever found, no one has tried to fake it. Instead, literary hoaxes tend to be more of the James Frey variety, with an author claiming a realm or set of experiences themselves that are false. These are the cases that seem to most common in accounts like Melissa Katsoulis’s Telling Tales: A History of Literary Hoaxes. However, in the world of the visual arts, this kind of forgery is not at all uncommon. It’s one of the fundamental differences between the various arts, and it is based on the reproducible nature of the written word and music. Original manuscripts and scores may be valuable, but the real money is in an original artwork like a painting. A literary work may be experienced a million times over with the same power even from a cheap paperback copy, and the power of music lies in the details of its performance, but the original painting can only be experienced first-hand, in person, in the flesh. Even rough, imperfect, one-of-a-kind preliminary sketches made in preparation for prints can take on more value than the prints that were their ultimate end. The New York Times covered such interesting happenings in the art world this week, with a different kind of retrospective from that of Cindy Sherman—an account of what is evidently a fraud perpetrated on the art world for nearly twenty years. A small-time art dealer, Glafira Rosales, is now tangled in legal troubles for numerous paintings she sold as works by some of the best-known Modernists—Rothko, Motherwell, Diebenkorn, de Kooning, and Pollock. Ann Freedman, former president at the famous Knoedler gallery, was evidently drawn into the fraud, bought several of the paintings herself, and helped to sell others for millions of dollars. Now Knoedler has closed and many of the paintings’ purchasers are suing for their money back. And yet, the case points out the extent to which artists can be imitated, just as writers can. Pastiche, in fact, frequently forms part of an artist’s tutelage, and sometimes people are very good at it. What is viewed as a helpful learning practice becomes criminal, however, if someone gets too very good at it. And in the art world large profits can be had in this way. In the recent case reported by the Times, there is no conclusion. No forger has been revealed, and some still claim that these paintings might, somehow, be authentic, even though some of the paints used in them were not available commercially at the dates they were claimed to have been painted. But I am compelled to think about that forger or those forgers and how he or she or they decided to produce these masterful paintings and put masterful names on them. These are paintings that fooled some of the world’s experts, and someone decided that money and the satisfaction of skill and cleverness would prevail over someone’s performance of his or her or their own talents. Well, being able to fool the experts is, I suppose, a talent of its own. I can see the appeal, actually, of working for a fame in someone else’s name. Of sticking it to an art world where fame and income are restricted to a very select few even though many have talent to spare. Of playing a trick on a universe where work that is done out of deep, self-motivated reaches of the imagination is then commodified and traded like so much chattel. There is such a hateful despair in the theft involved. It’s hard for me to see one artist doing this to another or to herself or himself. These cases seem to me to illuminate the chasm between the two channels of art: the need to communicate through whatever medium, on the one hand, and the business of buying and selling and making contacts and fostering fame on the other. It’s not a new conundrum, and different writers and artists and musicians have answered it differently over the centuries. For myself, it is true that I would love to sell another book sometime, to be paid for my labor. But that isn’t why I do it. I watch so many of my cohort desperately scratching at the door, and I both admire their business sense and wonder what their work would be like without it. Obviously, balance is in order—I would not have all my writer friends starving and homeless, and I would enjoy a world where expertise and skill in the arts were respected far more than they are these days. I know that a lot of writers, musicians, and artists do what they think they have to do to survive and thrive. But I would not have us all pretending to be Motherwell or Rothko or Hemingway, in either name or fame. And I have a sneaking suspicion that the artist who engages with the world without constantly grasping at fame—whether in his or her own name or that of another—is all the more free to pursue the ragged path of art. Posted in Culture & Arts, Psychology, Visual Arts, Writing and tagged Ann Freedman, art forgery, Ernest Hemingway, Glafira Rosales, Jackson Pollock, James Frey, Knoedler gallery, literary hoaxes, Mark Rothko, Melissa Katsoulis, Richard Diebenkorn, Robert Motherwell, Stephen King, Willem de Kooning. Bookmark the permalink.